If, Gentle Reader (Gentle Ann), you are thinking of making a lopapeysa, my first advice is to think about what kind of knitter you are. If, like me, you plunge headlong in to a new pattern, chirping “how hard could it be?” or “tallyho!” — then you do not need a tutorial. As a veteran of five lopapeysas, I can attest that the instructions for Riddari and Verur (both typical Icelandic yoked pullovers) work just fine. Like turn-by-turn driving directions, yoke joinder instructions don’t make much sense if you are reading them on your computer in another state. But if you are in your car, at the corner of 108th and Maple, and it says, turn left and the gas station will be 50 feet ahead on your right, the direction makes sense in that moment, and you get there just fine. Have no fear that if you follow the instructions on your lopapeysa pattern, when you actually find yourself ready to join up the parts for the yoke, you will be able to do it. For more reflective and perhaps more anxious knitters, who want to understand a thing before they undertake it, I hope this exercise will help. To knit a lopapeysa in the bottom-up tradition, start by knitting the body up to the armpits (it’s a tube), and then knit the two sleeves up to the armpits (two more tubes). Now, you find yourself in a three tube situation. All three tubes have live stitches at the top, either on circular needles (preferred) or on strings or other stitch holders. The bird’s eye view of the thee tube situation can be illustrated by two tumblers (the sleeves) and a bowl (the body). The big oval (ish) line so artfully drawn here (technology!) shows how you want the stitches at the top of the three tubes to line up at the end of the joining round. Start by putting a small number of underam stitches (centered on the stitch marker that marks the beginning of the round) onto strings. (Dishcloth cotton works well.) 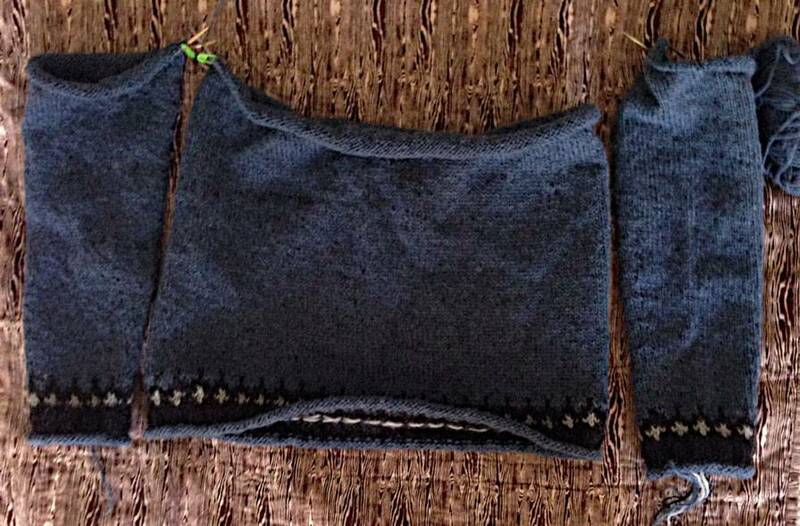 The number of underarm stitches you hold in this manner varies based on the size of the sweater. For a man’s sweater it will be something like 12. We’re going to say it’s 12. In the illustration above, the short dark lines on the inner sides of the tumblers show where you will put the 12 stitches on a holder on each sleeve. Now you get to start knitting (in the main color, no colorwork on this round). Start at the beginning of the left sleeve (the first stitch that is not on a string), knit across those stitches until you are back at the string on the sleeve again. Now start knitting across the front of the body (starting at the first stitch that is not on a string). The pattern will specify how many stitches to knit. (Count carefully.) When you’ve knit that many, place the next 12 body stitches on a string, for the right underarm. Now, start knitting on the second sleeve, starting again at the beginning of the sleeve (the first stitch that is not on a string). Knit across the sleeve stitches until you are back at the sleeve string again. Now start knitting across the back of the body (starting with the first stitch that is not on a string). Knit all the way across the back of the body until you get back to where you started, at the beginning of the left sleeve. Put a stitch marker there to mark the beginning of the round, and Bob’s your uncle. This is how a three tube situation looks flat, right after being joined up. This is how it looks from the bird’s eye view, after you’ve been working on the yoke for a few inches. A gaping maw of sweater innards, yes. 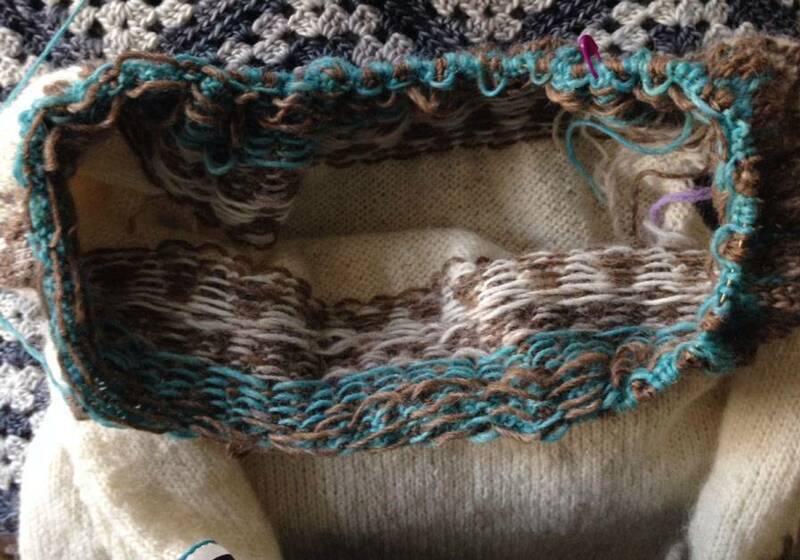 But a very well organized gaping maw of sweater innards, which is going to block just beautifully. One thing that came up on Instagram was that after the joinder round, the first few rounds of the yoke may seem a little tight at the joins between sleeves and body. How uncomfortable this is will depend to some extent on how long the cable of your circular needle is, but a little tightness at the joins is inevitable at first, as the sleeve stitches get stretched out a bit to join up with the body, and this makes them unhappy. A clever young someone (Cirilia R) started talking about how she liked to do “a bit of magic looping” to ease this situation. I am sure she is right, and this works just great, but it is not something that I am likely to do. Again, it’s a personality-of-the-knitter thing. I like to learn skills, such as Magic Loop, strictly on an as-desperately-needed basis. Like the venerable beast of burden that I imagine myself to be, I do not contemplate clever ways to overcome an obstacle if I have the option of groaning softly, putting my head down, and waiting for the discomfort to pass. In this case, if your circular is a reasonable length (not too long), the tightness is gone in a couple of rounds, and you gallop through the yoke. Perhaps snorting a little from high spirits, even. But if you know the Magic Loop method and are fully, joyously alive to the myriad ways in which it can enhance your life, then by all means, go to it. We are knitters. We are here for this. What happens to those 48 stitches languishing on strings? After you’ve bound off the yoke at the neck, you will graft the 12 stitches from each sleeve to the corresponding 12 stitches from the body. It makes a little hinge, ever so neat. Now you can put on your lopapeysa and flap your arms around as much as you want. Life keeps getting better and better. Hope this helps all the lopapeysa hopefuls out there. Thanks for asking the question, Susan. I wish someone had explained this with those very soothing and funny words when I was struggling with my first ever knit-in-the-round sweater, and my second, which was a Riddari. Many, I know, will find this useful. I know, right? I laughed so, so hard at this. That whole PARAGRAPH is the best ever! Love you, Kay! I agree, what a great sentence! Thanks Kay! Now I will sit down with a soft groan and finish this baby blanket. I’m lovin’ those green swirly sleeves! I’ve tried to explain this process to people several times, and you’re right — it’s the sort of thing you really have to just do for yourself, trust the process and see how it happens as it happens. I never would have thought of that birds-eye bowl and tumblers approach, though! And I should have known your answer to my question about how you handle those tight first union rows would be “groan and bear it”! The only time I’ve ever done a sweater with this kind of construction was my Walpole cardigan and I thought for sure I was doing something wrong because it was so incredibly awkward. I actually put the sleeve stitches back on two DPNs and worked around them that way. I did not enjoy those few rows, but you’re right — they’re brief. And the sweater survived it just fine. I just want to thank you and Ann for continuing to blog. I realize that blogging is so over. However, some of us do not want to deal with Twitter or Instagram or WhatsApp or Whatever, and thus deeply appreciate your continuing to use this dinosaur medium. I love the short posts, but blogging is particularly well-suited to longer posts, such as this one, in which significant educational information is conveyed. Here! Here! So glad for this blog; the humor, the pictures, the adventures in knitting, the knitting group feel of the comments. Though I didn’t know blogging is over. I hope not because I still post to mine and still read many knitting and quilting blogs. Though I always check Mason-Dixon first for what’s new! I so agree and appreciate the blot. Especially since. I just read about it in knitscene mag. Another outdated. So they say! Ha! What do “they ” know. I detest that awkwardness at the sleeve/body join when you first put everything together. I usually just do the first few rounds on two circular needles to alleviate the pulling between sleeve and body pieces. After an inch or so of knitting, I keep going on one circular. I do the same thing with 2-circs, as I tend to use metal chiagoos, and it is best not to put a ton of tension on their metal cords. Unless you don’t fear them breaking on you at the most inopportune moment, as they are wont to do. Susan, what an excellent question (again). For extra credit, do not break yarn on one of your sleeves. That way you can call it the left sleeve, starting the join where you stopped putting the 12 sts on a string (you have to knit across them before putting them on the string so that the working yarn is in the right place). This makes you feel like you have one fewer pair of ends to weave in, although I’m not sure it really works out that way. You are a woman of my own heart. Your words paint a picture in my mind and I feel like we are old friends. I know we are not (that might be a bit creepy) because you don’t know me although I have been reading your blog from the very beginning. I think I shall snort a little now and go cook dinner. Wow. All I can say is “wow.” Your explanation is amazing–thank you for your guidance on this. I’m *almost* ready to try this! Oh Kay, If only I had seen this before I attached the sleeves of my Owls sweater to the body. It was painful because as lovely and clever as this pattern is, the author did not specifically point out that the stitches on holders can stay there until you are ready to graft them. Probably because it was obvious to more advanced knitters. It made for some interesting twists that then had to be untwisted as well as two rather gap-y underarms that will have to be sewn shut in some creative way. All worth it now that you have shown us the True Way! Wait, could you go over that one more time? AW JK JK JK. This is so inspiring that I want to rig up some tube socks and a cowl just so I can how this deal works. Masterful! I shall wait to see the joined tube socks and cowl!!!!!!!!!!! I love your tutorial and it came with good timing because I am working on my first sweater with this type of construction. I’ve knitted lots of sweaters but have somehow missed this construction until now. I’m knitting Vivian (http://www.ravelry.com/patterns/library/vivian) which is a heavily cabled hoody cardigan – my body tube will be an open tube which should only effect the beginning of the round. I’m a “how hard could it be?” knitter so was not worried about the joining round in the least. My biggest worry is having to wait to join until I have knitted two whole sleeves! Now when I am ready to join, I will envision a green bowl body and two swirly tumbler sleeves! Brilliant! 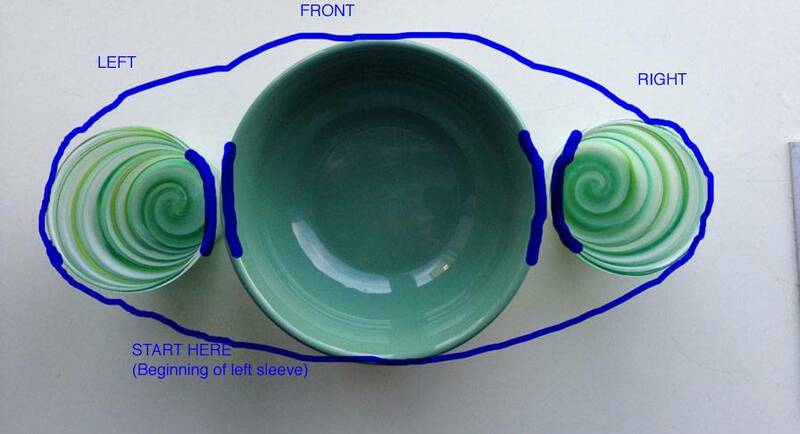 Your photo with the bowl and two glasses is not only an effective way to explain the construction, but it is such a strong, beautiful image, that it will stick with us and be there to hold our hands on future yoked sweater projects. Thank you!! Fabulously hilarious! And accurate! Kay, you never cease to amaze. 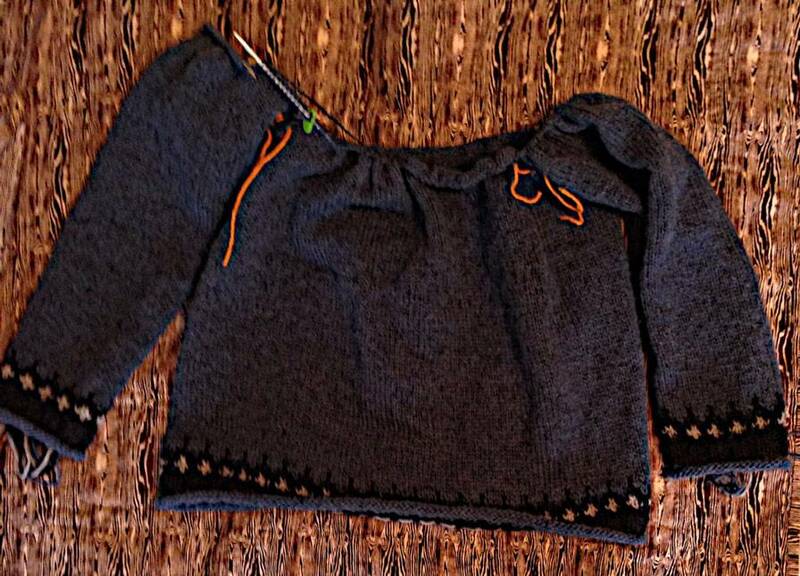 Do I recall correctly that you made at least one lopapeysa with the knitterly equivalent of pit-zips? I think you bound off those underarm stitches, leaving a little air space so the wearer would not die of overheating – those things are WARM! My problem with the bottom-up construction is that those underarm stitches get stretched out at the ends, and it’s a real challenge to get them all nicely tucked back in where they belong. Any tips? Kay! Perfect description with graphics! Aren’t you fancy. Really was a simple map of a potential traffic jam! Not only do you have sweater joining in your bag of tricks, you also seem to be able to change the color of the sweater as well! Can we look forward to a tutorial on this in the near future? This could help greatly in those situations where the intended recipient, upon being shown a 3/4 completed sweater, changes their mind about the color they requested and now wants white instead of blue. As always, you crack me up! Thanks for the entertaining tutorial, as I want to make one of these someday. I made some pants for a doll family a few years back and worked out how to go from one body tube to 2 leg tubes in kind of reverse from this…knitting halfway around and adding stitches for inside of leg, working one leg, then doing the same on the other leg and grafting the added stitches at the end. Anyway, I was proud at the time that I figured that out : ) In knitting, and in general, I tend to just jump in and figure I’ll deal with the problem when it comes up. Interesting, guess that’s why I married a detailed oriented, plan-ahead kind of guy. Love the green dishes, too! I am working on a cardigan that is constructed in this same way, making three tubes then attaching them. Last night I had to rip out three inches of the yoke because I noticed that I made the two sleeves exactly the same and attached them to the body that way. Three inches up I realized that the increase stitches were visible on one and on the underside of the other sleeve. Disappointing. I ended up knitting another half row on one of the sleeves before starting again. Arugh. Oh, I do so love the way you (and Ann) write. I have read and reread your books, because, like the blog post above, they just plain make me giddy with joy. 🙂 Thanks! Sorry, but when I see “tubes” I can’t help but think of Ted Stevens. Your sweater is a series of tubes, just like the internet! reminded me of a uterus and ovaries! I know; it’s crazy! thank you for the glimpse into the sweater maw. what a lovely thing indeed. the un-obvious simplicity, comfort, the wearability of a lopi sweater. so great. What a great tutorial! And the sweaters are pretty cool, too . . .
You know, I never planned on making one of these before, but now that I see that it’s all done in the round with almost no sewing, I’m so there. It’s not “almost” no sewing. No sewing! I don’t even graft the underarms; I do a 3 needle bindoff. It’s under the arms, so what’s the point in being fancy? Weave in ends and it’s done. Very satisfying. I, too, consider myself to be a beast of burden – it comes with knitting on the subway – I have been doing it standing up quite a bit lately, though I do actually do a little bit of magic loop. But I’m really just commenting because I ain’t got no instagram acc’t but saw your pic here and just signed up for the indigo workshop. Not to take away from this now-finished lopapeysa since I saw it on the insty-gram and it is my leading favorite of yours–but that demonstration of how to attach ? Best sweater support diagram ever. Totally made my day. Aaaaah, finally I understand it! You should do a video . I would definitely get it! Well, it’s been a lonely sort if time, as I felt no need to read this post because I knew that I would never make the sweater. Then, I just thought of that time tested adage “never say never”. Kay, I only had to read it once! Just when I was thinking that I had lost track of some stitches, you were talking about grafting those (48) stitches! YES! I did not lose track of them–there they were in your tutorial. I now feel confident that I might just be able to do this some time, no prob. There is just one little thing, I did not initially read the Magic Loop part. I eventually did read it, pulling myself kicking and screaming through those torturous few sentences, and found that it was not so bad at all. Thank you, Kay. I came. I read. I understood. I’m working on a Stopover and have come to this point in the pattern. I like that I was able to put “three tube situation” in the search box of the new-and-improved MDK site and it brought me here. I love technology. Love this Blog! Please keep up the great work! Thank you for a wonderfully evocative and visual explanation, Kay! Thank you so very much on behalf of all knitters not yet exposed to this possibility. Being a “lazy”, not-wanting-to-sew-my-knitting type of knitter, I “unvented” (All credit to EZ for this term) this solution many years ago. My only addition is that I actually use three-needle-bind off instead of grafting, and I do that first before joining all parts to work in the round. I find it addresses the tightness issue as well as making sure those underarm stitches don’t go anywhere. Perfect and thank you. Fears allayed, I forget ahead!